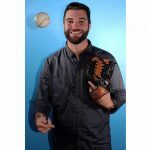 Josh Mason is a guy from the midwest who has passion for sports, video games, and sports video games. From coaching college baseball to playing The Show on ps4, baseball and the Chicago Cubs are huge passions of mine. Ken Griffey Jr. Slugfest was the first sports title that got me hooked, and I've been playing ever since. Nowadays you can find me on the ps4 console playing NBA 2k, Madden, Call of Duty, and/or Rocket League. Outside of video games I enjoy art/drawing, a good podcast, and watching classic WWE matches.